If you’re trying to lose weight, eating whole foods instead of processed foods is a great start. As an added bonuses, many of these foods will help you lose weight and prevent disease. 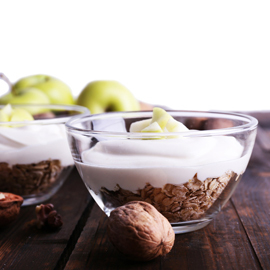 Greek yogurt: Although it has twice the protein of regular yogurt, Greek yogurt is still packed with the calcium and immune-boosting bacteria you expect from the popular dairy product. Fat-free milk: While you’re in the dairy aisle, pick up a gallon of fat-free milk to help reduce your risk of heart disease, back pain, depression and certain types of cancer. Salmon: Loaded with omega 3 fatty acids, eating salmon at least once a week can help you lose weight and have younger looking skin. Oatmeal: A half cup of oatmeal for breakfast can improve your cholesterol, reduce heart disease, and help prevent type 2 diabetes. To help fight hunger, combine oatmeal with a low-fat protein source for breakfast. Avocado: Add it to a salad or top your favorite sandwich. Eating avocados could help prevent loss of sight as you age. Broccoli: Research suggests that lightly steaming this green vegetable provides the most health benefits. And this is one vegetable you want to eat often. Eating four servings a week may reduce your risk of dying from any disease by as much as 26%. Sweet potatoes: Like other orange foods, sweet potatoes contain beta-carotene, which your body converts into vitamin A. Vitamin A helps maintain healthy eyes, skin, and respiratory, urinary, and intestinal tracts. Adding these healthy foods to your diet in place of processed junk foods will help you lose weight and enjoy a better quality of life for longer.